Saraya-Jade Bevis, better known as Paige, is one of the most important WWE wrestlers to emerge in recent years. After all, she won the Divas Champion belt at the age of 21 and, as a result, ushered in the Women's Revolution. But before any of that, she was just the youngest sibling in an eccentric wrestling family in Norwich, England. Fighting with My Family tells her story. 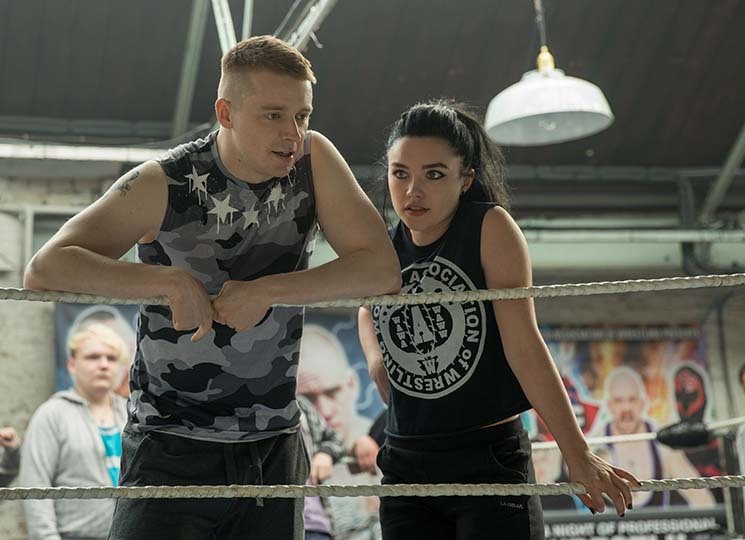 Loosely adapted from a quirky cult documentary that arrived before Paige was signed to the WWE, the film maintains plenty of quirky comedy in the capable hands of Stephen Merchant (The Office, Hello Ladies). It's also got an impressive cast, including Vince Vaughn, Nick Frost, Lena Headey, Julia Davis and notorious scene-stealer Dwayne "The Rock" Johnson (who also produced the film). In all honesty, the film is nearly artless, its drab, blown-out cinematography paired with canned music that evokes a Disney Channel sitcom. Further, the beats of the film are entirely familiar, almost to the point where you can predict each scene before it happens. That said, there's nothing more satisfying than a rags-to-riches sports story, particularly when it takes place in the larger-than-life world of the WWE. Further, what Merchant lacks in artistic flare he makes up for with extreme comedy chops, bringing out the best in everyone while making the most of a script that's peppered with jokes. Obviously this film is a must-see for rabid wrestling fans. For the rest of us, Fighting with My Family is a fun, heartfelt romp that does its subject justice.